Do you have a pile of Junk that needs to be removed? Well, instead of going through the headache of renting a truck or bin, wasting an entire day or longer, allow Toronto Junk Removal to do all of it for you! When we do the work, we’re efficient and more affordable than doing it yourself. 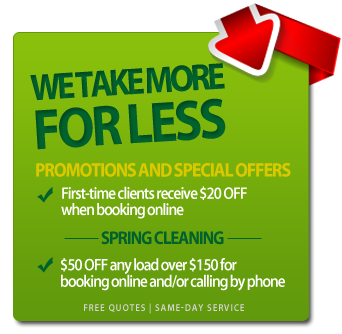 With our full service, we can take away anything from your GTA home or business. Just point and we’ll take it. Also, you only pay for the space junk takes up in our truck. Whether you have a few items or several truckloads, schedule a pick up. Your unwanted junk will be gone before you know it. Check Facebook and Twitter for some of our specials!